If you are considering replacing your windows then it is likely you have already thought about the pros and cons. That said, at Charles Window it is important that our clients know the real benefits of new windows. Read on to learn about three benefits to replacing your windows. Remember that you can always reach out to Charles Window for help finding the right windows and getting the best installation options. When your windows are installed correctly, they let in the light you need but keep out the drafts. What’s more, they can keep out extra noise too. If you want to enjoy every room in your home – and reduce pockets of hotter or cooler air in certain rooms – then new windows may be what you’re looking for. As we mentioned above, many older windows have gaps that allow heat in. This isn’t the only way that your home can lose heat, coolness, and money. Solar heat gain is also a common way that a home is less energy efficient than it should be. In fact, one study showed that a single-pane window causes about 1/3 of the heat loss in a home in winter and as much as ¾ during the summer months. 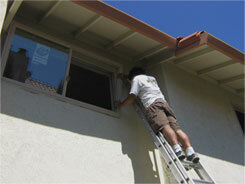 Today’s windows have designs that both limit draft and prevent solar heat gain. For example, there are window frames made from materials that have very low thermal conductivity. There are also Low-E glass windows that lower heat pass-through by as much as 80%. When you replace your older windows with energy efficient options, over time they can pay for themselves in lowered energy costs. However, according to one study, replacing windows can also increase the value of your home. The study looked at two window replacement projects. Both were replacing ten double hung Low E glass windows that were 3 feet by 5 feet. In one project, wood windows were used and in the other vinyl windows were used. The results were impressive: On average a homeowner in the L.A. area saw more than 91% of a return on investment with the vinyl windows and more than a 95% return on investment with their wood replacement windows. This makes it very clear: Replacing windows is a smart investment. To learn more, let Charles Window help you!